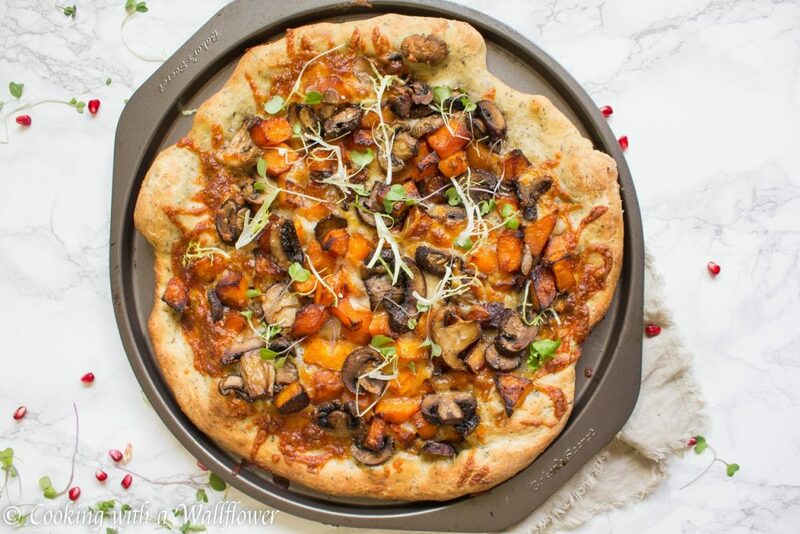 A homemade or store bought pizza crust topped with melted mozzarella cheese, roasted maple butternut squash, garlic mushrooms, and garnished with a handful of microgreens or frisee. 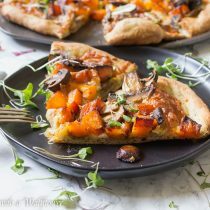 This fall inspired roasted maple butternut squash and garlic mushroom pizza is delicious and simple to make. I hope it’s been a relaxing weekend for you. I haven’t had a weekend where I had no work or events planned for weeks now so it was nice to have a low key one. Went to the farmer’s market Saturday morning, stopped at the mall for a (or half a dozen) black honey matcha cheese tart(s), and then caught up on some of my favorite fall shows. At the moment, I highly recommend 9-1-1. Has anyone seen it? Let’s talk about this fall inspired pizza. I’ve been feeling fall vibes for awhile now. And I’ve been waiting to share my fall inspired recipes with you. This roasted maple butternut squash and garlic mushroom pizza has fall flavors written all over it. One of my favorite fall ingredients is butternut squash. Something about the caramelized notes of the squash after it’s been roasted that’s so delicious and comforting. Tossed in maple syrup with a sprinkle of salt, it’s the perfect ingredient to add to a fall pizza. I’ve used pure maple syrup to roast with my butternut squash, but I’ve also used ghosted maple syrup, which if you guys can stand a little heat, contains ghost pepper extract. And of course, I like mushrooms in everything. Roasted with minced garlic and a generous pinch of salt, it’s exactly what I needed on my pizza. 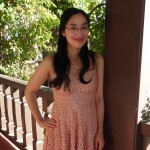 I like to use truffle salt, but you can use whatever salt you like or have on hand. Lightly grease a large baking sheet with olive oil. Set aside for now. In a medium sized bowl, add butternut squash, maple syrup, salt, and a little drizzle of olive oil. Toss until well combined. Transfer the butternut squash to the baking sheet. In the same medium sized bowl, add mushrooms, minced garlic, olive oil, and salt. Toss until well combined. Transfer the mushrooms to the same baking sheet. 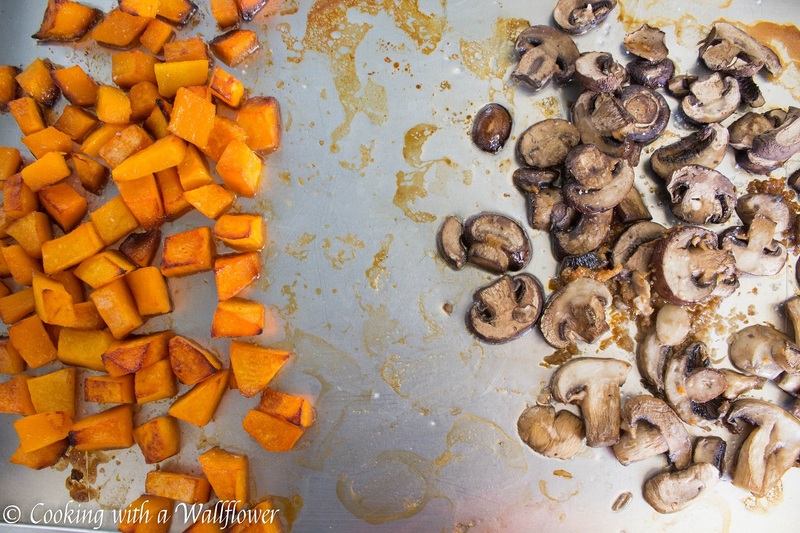 Roast the butternut squash and mushrooms for about 15-20 minutes until tender. Remove the baking sheet from the oven and set aside for now. Lightly grease a 12 inch pizza pan or a large baking sheet with nonstick cooking spray or olive oil. Place pizza dough on a lightly floured surface. Roll out the pizza dough into a 12 inch diameter circle. Transfer the pizza dough over to the pizza pan. 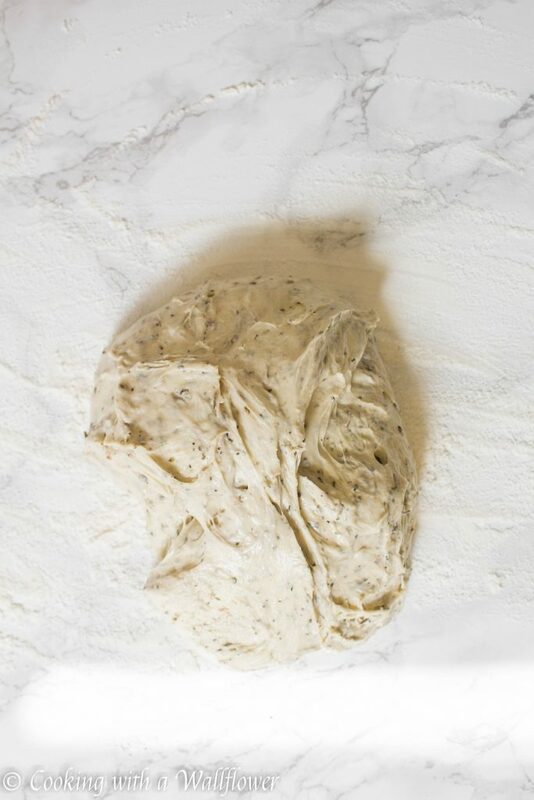 Brush olive oil onto the pizza dough to help it brown. Sprinkle shredded mozzarella cheese onto the pizza, leaving a 1/2 or 1 inch edge. 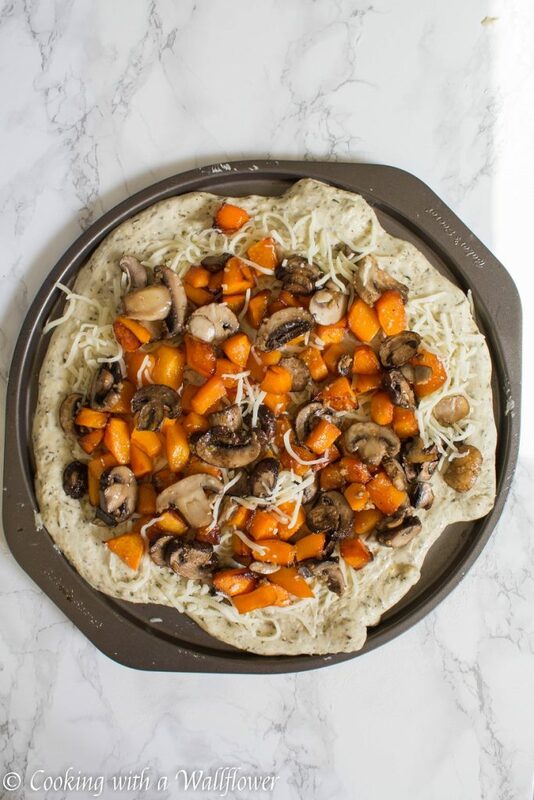 Add the butternut squash and mushrooms to the pizza. Place the pizza into the oven and bake for about 10-15 minutes until the crust has browned. When ready to serve, add a handful of frisee or microgreens on top of the pizza. Slice the pizza into 8 pieces. 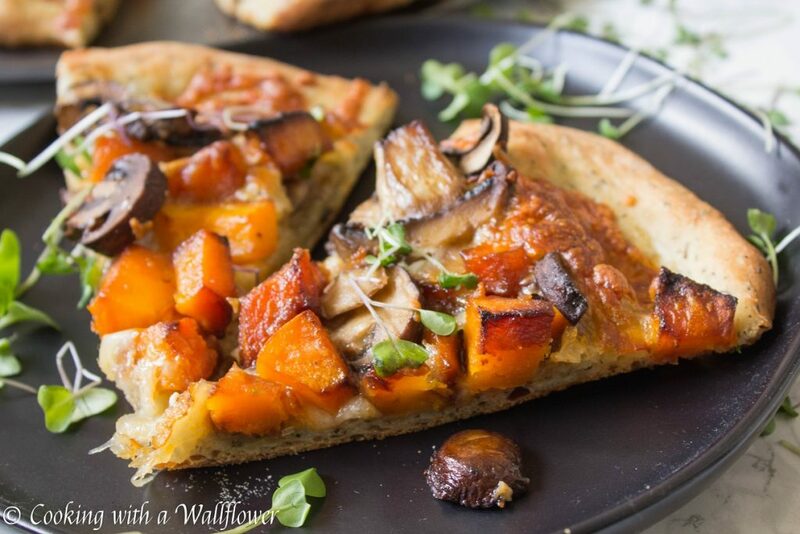 Serve the roasted maple butternut squash and garlic mushroom pizza with parmesan and crushed red pepper if desired. 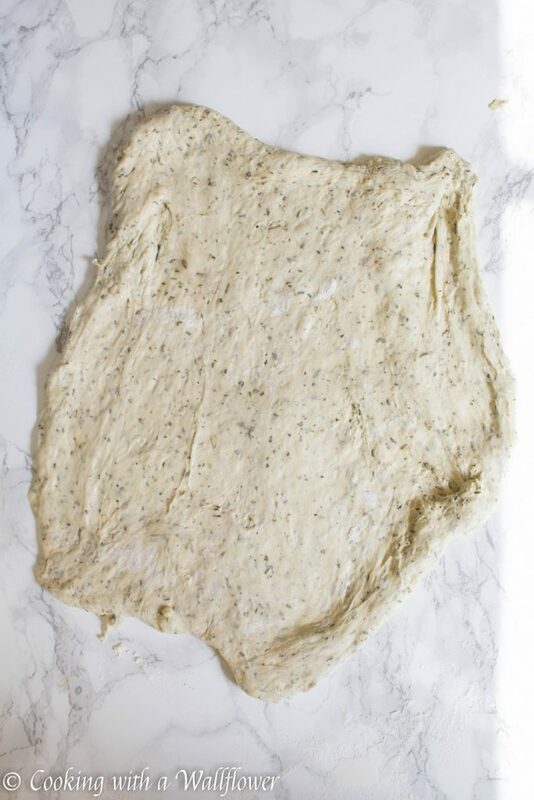 Brush olive oil onto the pizza dough to help it brown. Sprinkle shredded mozzarella cheese onto the pizza, leaving a ½ or 1 inch edge. 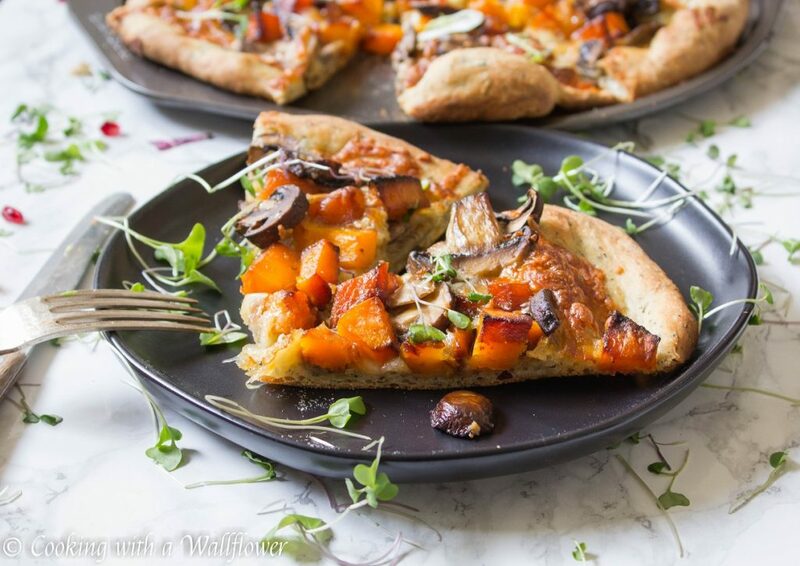 Add the butternut squash and mushrooms to the pizza. 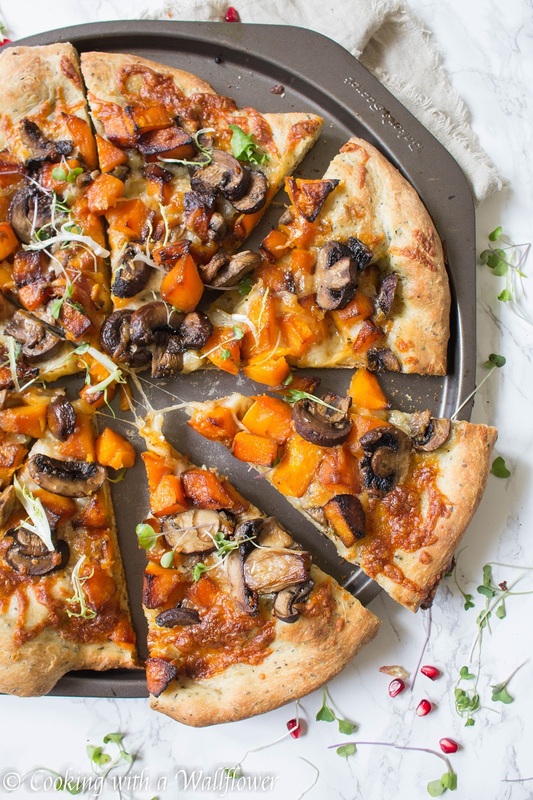 Serve the roasted maple butternut squash and garlic mushroom pizza with parmesan and crushed red pepper if desired. Sprinkle extra salt on top to taste. 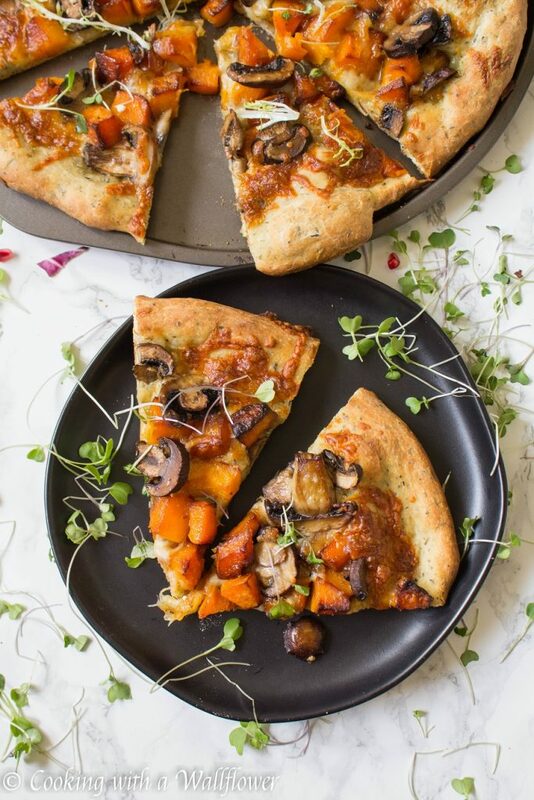 This entry was posted in Comfort Food, Entree, Fall Cravings, Farmer's Market, Healthy, Pizza, Quick and Easy, Recipes, Vegetarian and tagged butternut squash, fall inspired, fall recipes, farmer's market, healthy, mushroom, pizza, quick and easy, vegetarian. Dang, I just discovered I don’t have mozzarella but since everything else is ready, I’ll find a substitute. Dang, I planned to make this tonight for dinner and just discovered I don’t have mozzarella. Thinking what might be a good substitute. 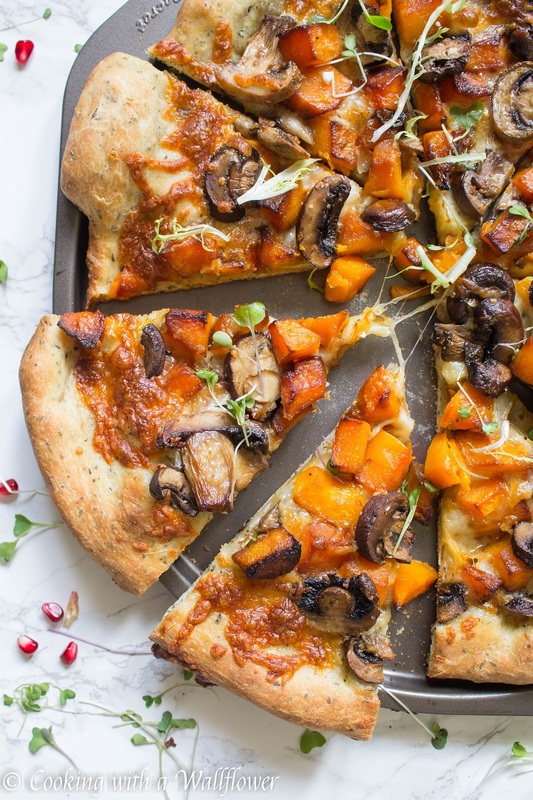 interesting toppings with the squash – i’ll try a small one to see how my family likes it for Friday night pizza. Yum! Very creative combination and sounds perfect!! Seasonal treat I’m looking forward to trying! You might be able to, but I’ve never used delicata squash in this so I’m not sure. I think I will use your ingredients and method to make this into an autumnal pie! Yum! Must make this now! Omg I’m drooling! !